It’s the smell of the roasted nuts while taking a stroll through Midtown Manhattan, the ambiance of the taco trucks in Los Angeles, the frenzy of activity and chatter in Chinatown, and even the echoes of the “peanuts, bottled water…cheaper out here than inside,” from the vendors on your way to the game. In so many ways street vendors add activity and life to our otherwise lifeless and cold streetscapes. And whether you’re grabbing a quick snack, lowly meal, or are just passing by, we are all impacted by the life these vendors add. This is a point that William H. Whyte hit on in his 1980 book entitled The Social Life of Small Urban Spaces. And, as Whyte continued, “vendors have a good nose for spaces that work.” So while it should be a goal to increase the amount of vendors we have on our streets, so that we’re increasing the amount of social activity that is occuring, it is even more important to create the urban spaces that foster this kind of environment. 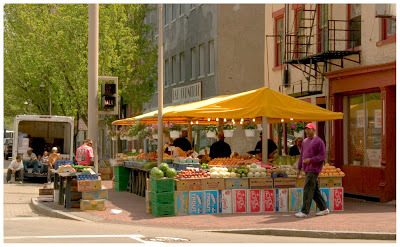 LEFT: Produce vendors at the Court Street Marketplace attract distributors, browsers and shoppers alike. 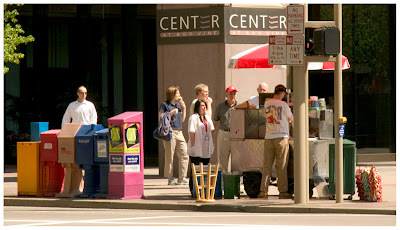 RIGHT: A typical daytime vendor at 6th & Vine streets in downtown Cincinnati serves up customers and attracts a line of people. Photos by Randy A. Simes. In Cincinnati we have the typical daytime vendor serving up hot dogs and other like delicacies, the standard vendors selling knock off sunglasses and jewelry, the game day vendors for Reds/Bengals games, and now Nada’s new taco stand. But can Cincinnati grow its street vendor scene and foster even more lively urban spaces? As Cox discusses the issue from a Portland perspective he then identifies the “Domestic Food Service License” that has been created there to allow individuals to make food for sale to the public out of their home kitchen legally. This simple, yet politically complicated, issue has fostered one of America’s best street vendor communities complete with taco trucks, cookie vendors, chocolatiers, and a variety of ethnic foods. And while boosting the amount of street activity through additional street vendors, the policy has also helped Portland’s thriving farmers markets. 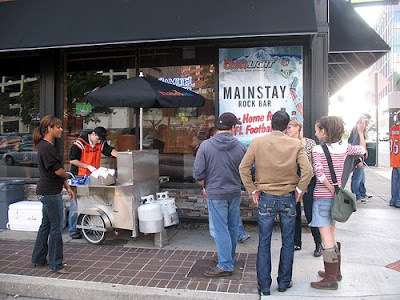 Nada’s new taco cart attracts people to the corner of 5th & Elm streets in downtown Cincinnati. The self-congestion theory is demonstrated here as people cluster around one another even though ample space is provided. Photo by 5chw4r7z. For Portland it was less about the design of their urban spaces and more about the policies that govern this interesting group of entrepreneurs. And I would say that Cincinnati is in a similar position where our urban spaces are already well-suited for dynamic and vibrant street life. What is needed now is a more flexible approach to dealing with those looking to operate in such a way. Let the street vendors grow organically, where they want, when they want, and how they want. Provide as few hurdles as possible and only require the information needed to keep track of the total volume of the street vendors. By embracing these individuals we not only create an avenue for more small businesses, and the grassroots innovators, but we can also create a better city by spurring more activity. So what food vendors would you like to see in Cincinnati? Where would you like to see them? Is it possible for Cincinnati to facilitate an environment where street vendors flourish?